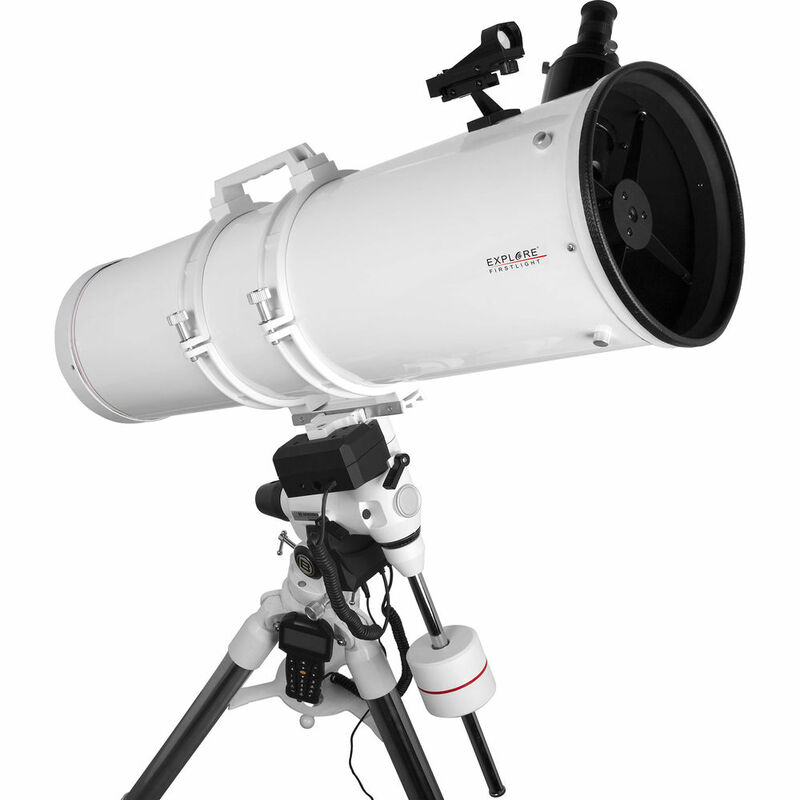 Built as a basic yet powerful optic, the Explore Scientific FirstLight 203mm f/4.9 GoTo Reflector Telescope is a reliable observation platform that can track the Moon and planets, with the capability of reaching out to brighter deep-sky subjects. It has a Newtonian reflector design with an over-sized hexagonal focuser, placed at the front of the optical tube, and adjustable mounting rings that allow users to place their eyepiece in the optimum position for viewing. A large aperture and respectable focal length produces a fast f/4.9 focal ratio to improve resolution and sharpness while reducing exposure times during astrophotography, with the potential for high magnifications. The SkyTracker kit includes the hand controller unit, and right ascension and declination motors. Its hand controller has a database of more than 272,000 objects with the ability for users to input custom coordinates and favorites. With a slew speed of 2Â°/second and nine tracking speeds the SkyTracker can accurately keep near and deep-sky objects such as the Moon, planets, galaxies, and nebulae centered in your eyepiece for long exposure imaging and astrophotography or for prolonged observation sessions. The tripod is built with large 2" diameter stainless steel legs and tight tolerances to reduce vibrations for clearer viewing. A center stabilizer bar pulls the accessory tray up to lock the legs in place, adding further rigidity and vibration reduction. It is adjustable from 26.8 to 42.5" to accommodate a wide range of users, and features large thumbscrews for tool-free adjustment in the field. An adjustable tray is also included with the tripod to keep eyepieces, flashlights, and other accessories safe and at the ready. Rounding out the included accessories is a 25mm eyepiece, a universal smartphone holder for capturing images through the eyepiece, and an unmagnified red-dot finder. Box Dimensions (LxWxH) 42.0 x 25.5 x 22.0"